Step inside the mind of one of today’s most influential rock guitarists. This all-access video couples instruction with the inside story of a self-taught guitarist who has made it to the biggest stages in the world. From techniques and exercises to writing and performing, Mark gives a comprehensive look at his playing and the ways he pushes himself to continue developing as an artist. Also included are in-depth guest lessons by Myles Kennedy, Michael Angelo Batio, Troy Stetina, Rusty Cooley and Bill Peck, making this the most informative and well-rounded guitar instruction video of all time. 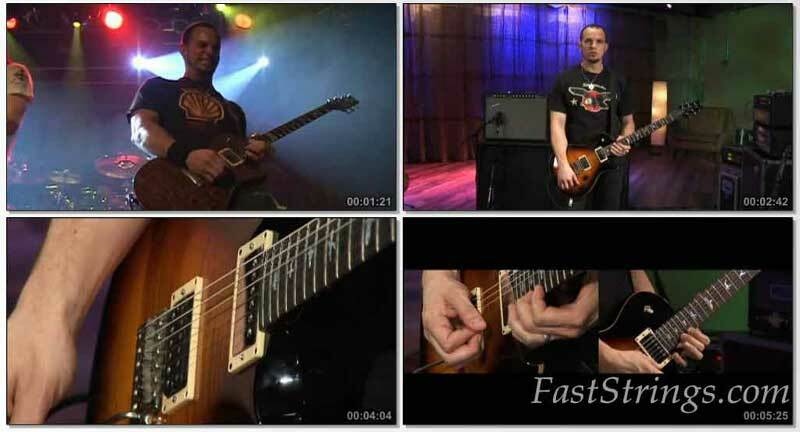 Mark Tremonti walks you through the solos and slows them down for you in sections. He also shows scales and has some unbelievable guest instructors on this video. Any guitarist will get something out of this DVD! He gives you step-by-step instructions that are easy( for those who are already familiar with his work and a good knowledge of guitar) to learn how to play. In 2 and 6 part the lessons showed by 3 cameras. Moreover, in the “Story” part mister-guitarist mainly tells and shows his equipment: boosters, guitars, pedals and even mediators. Throughout the DVD, mark also goes over his entire rig and his personal life. If you pay attention, you can pick up interesting tidbits, such as, even though for over 15 years. does this download still work? Hey admin, do you have the tab booklet of this? Nice share! Should be fun! Tnanks. Thanks a lot! I’ve been searching for the booklet for a long time! cool dvd, i want the download, but i cant see in the site ! Do you have the tab booklet? Anyone? It’s apparently useless without it. Great site! Indeed, great site, great shares. admiro mucho a Mark tremonti y este contenido es increible. does anybody have the tablature for Mark Tremonti-the sound and the story? Coeur D’Alene dude!! ROCK ON!!!!! Just can say “G R E A T”!!! I downloaded the tremonti dvd but have no sound to it. Am I doing something wrong, do you have an explanation? This is super influencial…and super cool..
thanks for this! this is a great site..
:yourock: I LOVE YOUR PLAYING NOT U!! When you are will come to SIANTAR INDONESIA?? ?